and to see the kingdom of God invade the entire globe. the Body of Christ in the things of the Spirit. Pastor Mark will be speaking and ministering at the prayer meeting at LJH. WCCA has been witnessing, over the last two years, a mini revival with hundreds of healings, miracles and conversions. SOMETHING AMAZING IN THE SPIRIT IS GOING ON in the Ottawa Valley, the Nation and beyond. We seek God and His presence to pour out. God spoke to many that 2012 was a year God wanted to take His church “where you have never gone before”. The LOVE, POWER and PRESENCE of God is at a level we have never seen before!God said, “I am making war against Chronic problems”, the chronic problem of the church being unable to get beyond its four walls. Ladies’ Breakfast. Julie Larocque. Apr 30/11 9:30 AM to noon. Rejoice and sing to the Lord! Rejoice and Sing to the Lord! 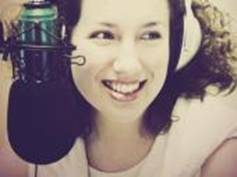 Radio announcer, television producer, and professional musician. Julie strives to find balance managing a busy young family and serving the Lord. followed by a set of original inspirational music. Lift Jesus Higher is having another Ladies’ Breakfast on the last Saturday of the month, March 26, 2011. You are welcome to join us. I write to you today asking for your support in helping First Nations, Métis and Inuit people to reconnect with the land. They believe that everything is interconnected and that the land, trees, sky, animals and water are part of the whole and are central to healing wounded bodies and spirits. Naategama or Peaceful Waters is a 230 acre property owned by the Archdiocese of Ottawa and entrusted exclusively for the use of Kateri Native Ministry. Located on the Ottawa River near the Quyon Ferry Landing, the property was donated to the Archdiocese in the late 1950s for a children’s summer camp. Later, it became known as Camp Echon. Under the direction of Kateri Native Ministry, Naategama has been used for Aboriginal youth retreats by Sagamok and Pikwàkanagàn First Nations. It has been the site for Elders retreats, community workshops, and family reunions of Indian Residential School Survivors. Kateri Native Ministry of Ottawa is moving forward with plans to improve the facilities by installing a floating dock to allow better access to the water for canoeing and swimming. In the long term, we would like to upgradewashroom amenities, construct a sweat lodge and continue with plans for a more permanent healing and training centre. Kateri receives no government funding and relies entirely upon the generosity of benefactors like you. A traditional bison feast will be held March 25, 2011 in Mac Hall, Bronson Centre, 211 Bronson Ave., Ottawa, ON, in support of improvement on the land. Tickets are $50 each or a table of eight tickets can be purchased for $425. Guest speaker Viola Thomas will speak on the importance of the land in native culture. 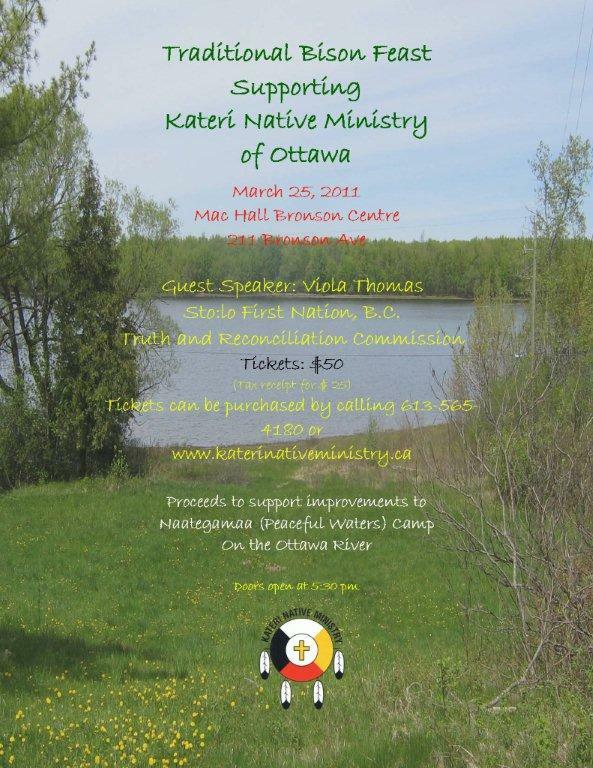 Tickets can be purchased at www.katerinativeministry.ca using the ‘Buy Now’ button or by cheque made payable to “Kateri Native Ministry of Ottawa” and mailed to: 310-211 Bronson Ave., Ottawa ON K1R 6H5. Tickets will be delivered to the address provided. Kateri Native Ministry of Ottawa is a Catholic lay ministry registered as a non-profit charitable organization. It is committed to the healing and reconciliation of Aboriginal people under the guidance of the Archdiocese of Ottawa. The Ministry provides spiritual and corporal works of mercy through the blending of Christian spirituality and Native traditions and culture. Your support of Kateri Native Ministry of Ottawa is appreciated. Please do not hesitate to call me with any questions you may have. Hi Ladies, and men with ladies in their lives. Lift Jesus Higher is having another Ladies’ Breakfast on Saturday February 26, 2011. You are welcome to join us. We would like to have as many women as possible hear the good words Martha Shepherd from Madonna House will have to share with us. Bring a friend or a family member or a neighbour. 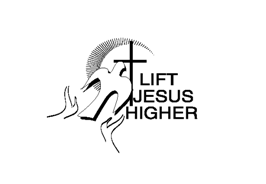 Lift Jesus Higher is having another Ladies’ Breakfast on the last Saturday of the month. You are welcome to join us. Saturday, January 29, 2011, 9:30 AM to noon. Interactive Testimonial Using Everyday Language with Lillian Culumovic. Lillian will share her walk into knowing God in a personal way while helping you put together your own testimony. Complimentary Continental Breakfast. A freewill donation is welcome! 518 Donald Street near St. Laurent in basement of St. Ignatius Parish. Enter by back door. PS. 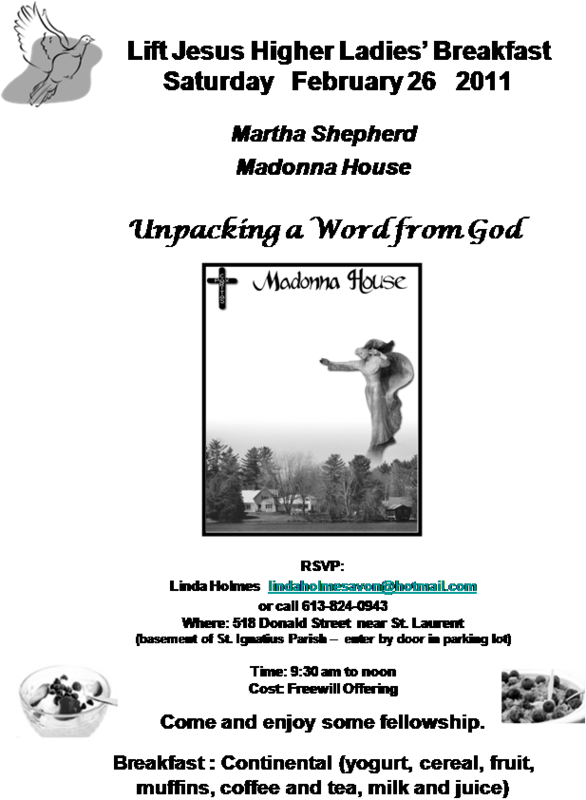 Next month, Feb 26/11, Martha Shepherd from Madonna House will be our guest. More info to follow. The Holy Catholic Church has been continually teaching us, and Common Sense agrees, that abortion is the gravest crime of modern society! But Mother Church is ever ready to provide healing and peace and to point to the solutions. John Paul II and our modern Popes have called for CONVERSION from the culture of death to the Culture of Life. In paragraph 88 of Pope John Paul ll’s “Evangelium Vitae”, he recommends the establishment of “Pro-Life Centres.” These will help to reduce the threat to Life throughout its spectrum. There are Pro-Life Centres in the USA ( Washington DC and New York ), but we need to focus anew on this prophetic call of the late Pontiff. 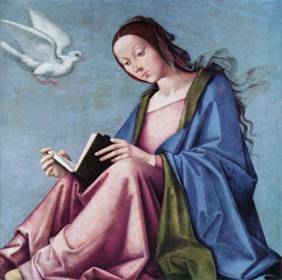 This “focus” necessarily begins with prayer (Come Holy Spirit) and study before the work begins. So opening Pro-Life Centres for Ottawa and other cities of the world are not easy targets! HENCE, THE NEED FOR THE PILGRIMAGE OF MASSES. Mark your calendars and come support our friends who live on the street. Meet the youth I have been working with and see how their lives are influenced by art. Please click here to view, download, or print the full October Newsletter. Don’t Miss this Exciting Evening of Entertainment and Encouragement! Justice Desserts is a fund raiser to help us continue our outreach to people in need. Rev. Greg Paul, founder of Sanctuary Ministries, Toronto, is our guest speaker for the evening. Our Auctioneer will be Dave Smith, Founder of Dave Smith Youth Treatment Centre. Also Youth art pieces will be shown and auctioned! Our youth will be presenting their work for show and silent auction. There will be a Silent Auction, door prizes, interactive art table, multi-media show & more. Mark your calendars and come out and show support for our Artists! !